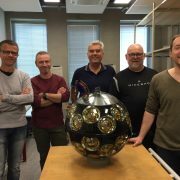 The KM3NeT team of the Neutrino group of Subatech, Nantes in France, participates to the instrument construction by taking in charge a part of the integration of the optical sensor modules. 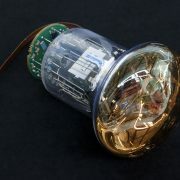 These modules are instrumented glass spheres with a diameter of 42 centimetre, equipped with 31 photo-multipliers and the control and acquisition systems. 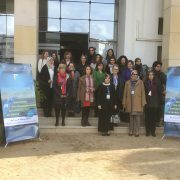 They are themselves integrated in groups of 18 to form detection units. Ultimately, with many KM3NeT institutes working together on producing the units, a total of 115 and 230 detection units will make respectively the ORCA and ARCA detectors accounting for more than 6000 optical modules. 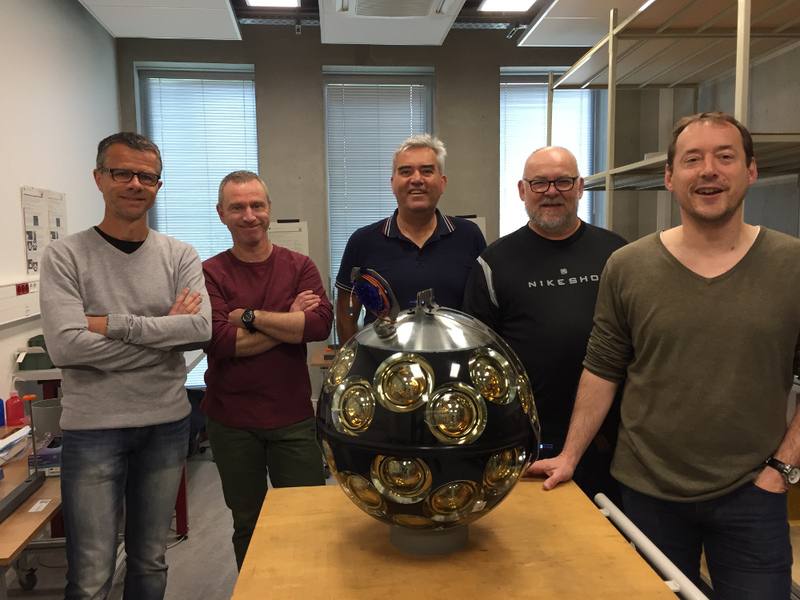 The picture shows the team of Subatech in Nantes with their first optical sensor module of a long series. 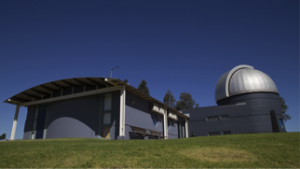 KM3NeT is very happy to welcome to the Collaboration it’s newest institute and a new continent, the Western Sydney University, Australia. Led by Professor Miroslav Filipovic, director of the UWS Penrith Observatory, the group has considerable expertise in gamma and radio astronomy. 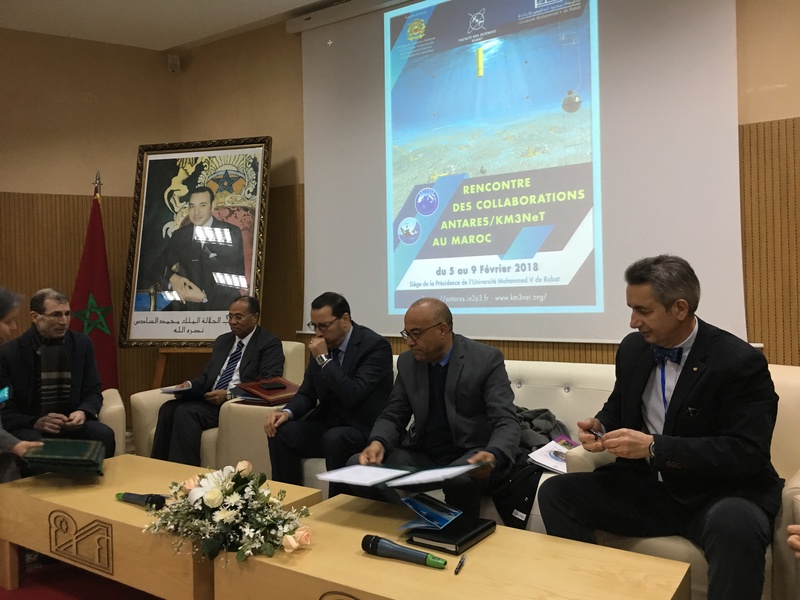 On 7 February 2018, during the KM3NeT Collaboration meeting in Rabat, a convention was signed between the Ministère de l’Enseignement Supérieure et de la Recherche Scientific du Maroc, l’Université Mohammed V de Rabat, l’Université Mohamed premier d’Oujda, l’Université Cadi Ayyed de Marrakech and the KM3NeT Collaboration for the setup of a production line of optical modules for the construction of the KM3NeT telescopes in the Mediterranean Sea. 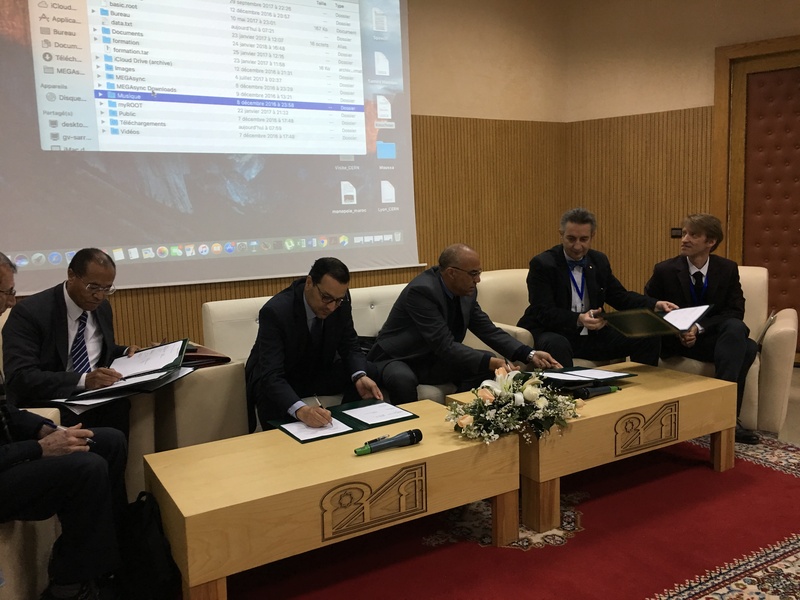 With the implementation of the production line the Morrocan groups in KM3NeT significantly contribute to the construction of KM3NeT. 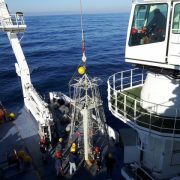 22 November 2017 – Geophysicists of NIOZ Royal Netherlands institute for sea research and members of the KM3NeT Collaboration, have successfully anchored a unique 3D array with 550 high-resolution temperature sensors at the KM3NeT-Fr site, about 40 km offshore Toulon. The device was anchored using the Ifremer/Genavir ship l’Atalante. The temperature sensors are mounted on a structure of five parallel lines with a height of 100 m, 4 m apart. It is transported in a folded form and the arms of the structure and the folded lines with temperature sensors are unfolded overboard prior to deployment. 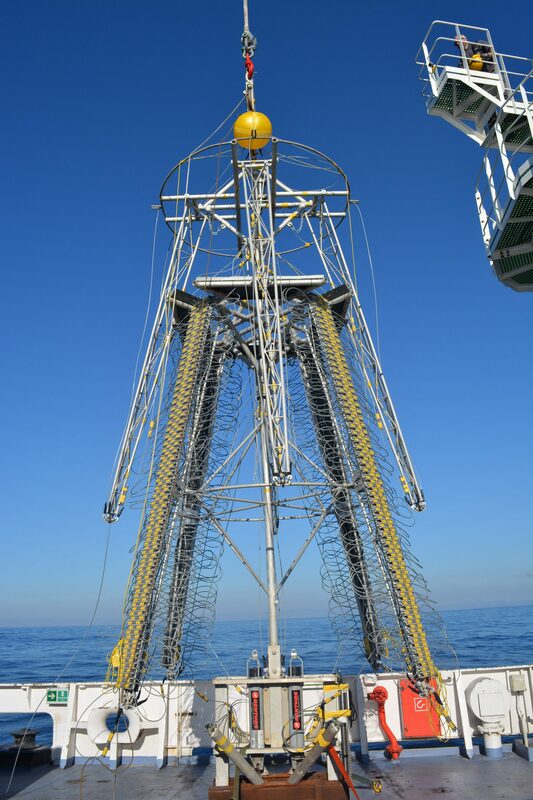 With this device geophysicists in KM3NeT will study the motion of the Mediterranean Sea at a depth of about 2500 m. The deep sea is constantly in motion and waves develop supported by stable water layers. 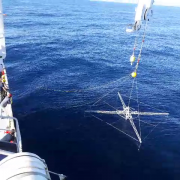 These internal waves in the deep sea are much slower than the waves at the surface, but are much higher: 10 m up to more than 100 m. With the NIOZ device the turbulence and wave breaking in the deep sea can be measured with high precision. See for an earlier deployment of the 3D sensor device the video below. First it shows the deployment of the top of the line with a.o. orange buoys. This is followed by a fascinating interplay of people pulling strings at the right time to unfold the structure. 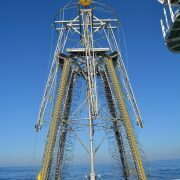 Once the structure is unfolded it is connected to the top of the string before descending to the seabed. 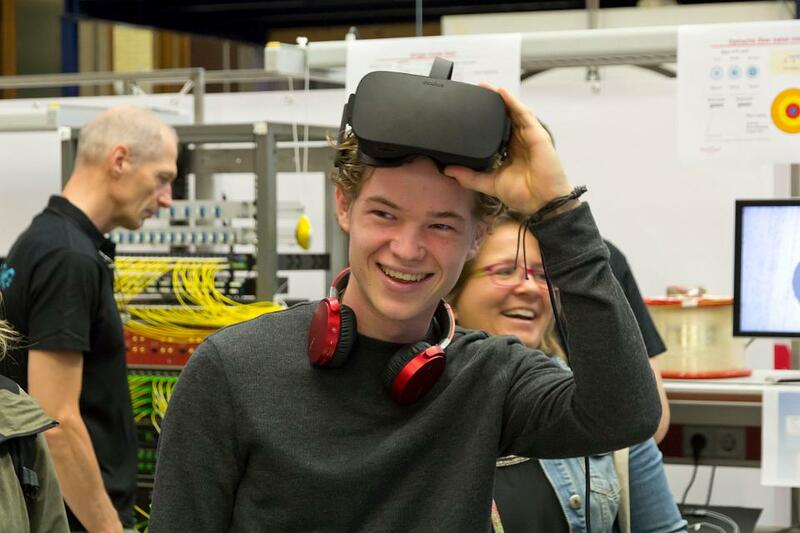 Watch this trailer using a google cardboard or any VR glasses. 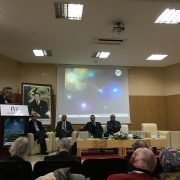 This is the trailer of the KM3NeT virtual reality Experience by Carlos Maximiliano Mollo researcher at the “Istituto Nazionale di Fisica Nucleare” (INFN). 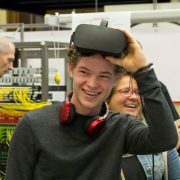 KM3NeT Experience is not only a virtual reality adventure but also an interactive electroacoustic music composition. Sounds and music were made by Alba Francesca Battista. 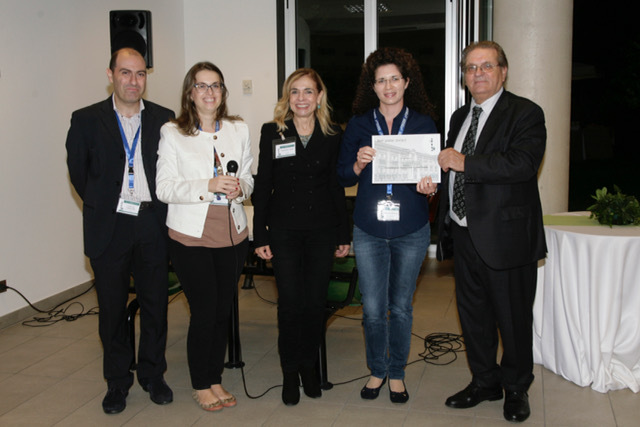 26 October 2017 – The KM3NeT Collaboration congratulates Giovanna Ferrara of INFN/LNS and the University of Catania, Italy with the award of the best poster presented at the Conference for Neutrino and Nuclear Physics, CNNP2017, in Catania, Italy. 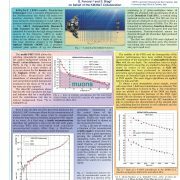 With the poster ‘First results of the KM3NeT/ARCA detector‘, she presents the preliminary results of detailed studies comparing Monte Carlo predictions and the measurements collected in about a year of data taking with two ARCA detection units. 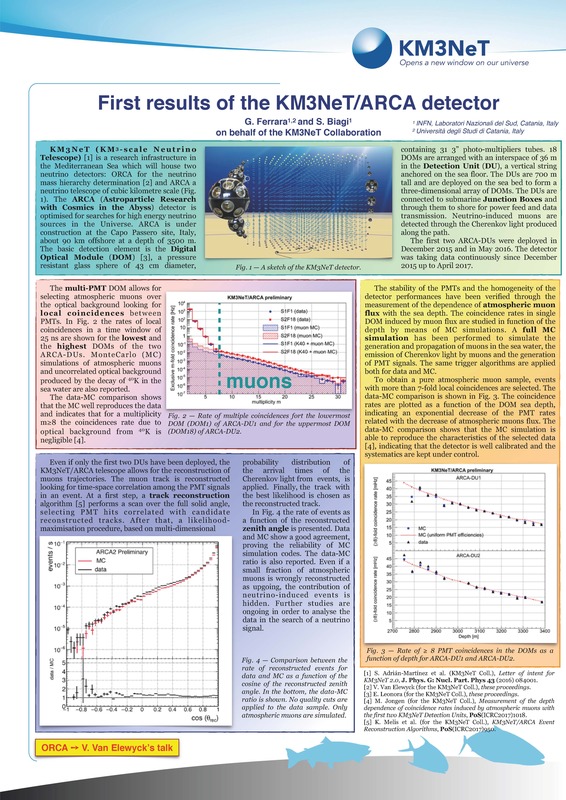 In particular, she shows that the measured dependency of the flux of down going muon particles with the depth in the sea is in agreement with prediction. The results confirm that the ARCA detection units are well calibrated. 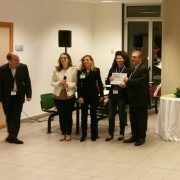 The award ceremony. 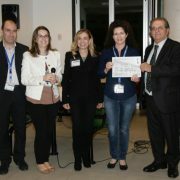 Giovanna Ferrara second from the right. 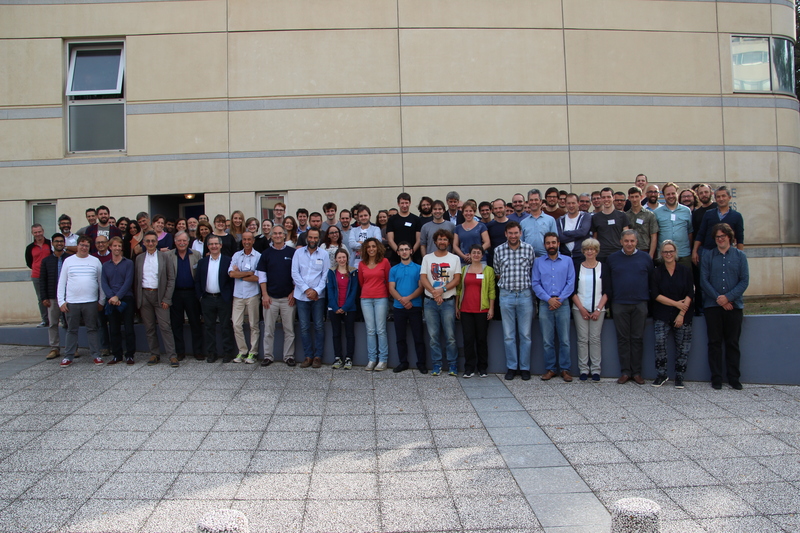 This week, 2-6 October 2017, researchers and engineers of ANTARES and KM3NeT met in Marseille, France for their yearly Fall meeting. 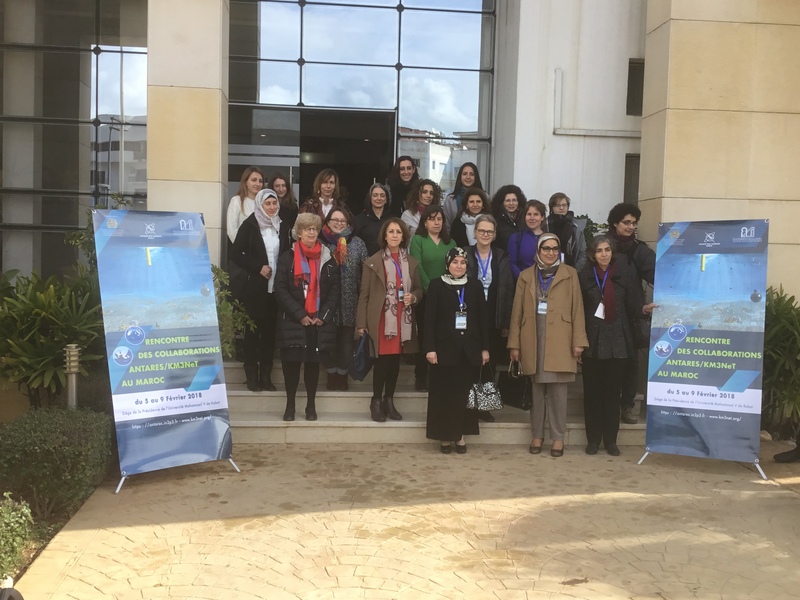 The Collaboration meeting was organised by the colleagues of the ANTARES/KM3NeT team of the CPPM research institute for particle and nuclear physics. 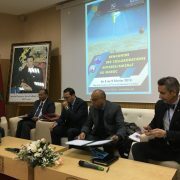 A week full of science and technology reports and discussions including the presentation of the first data of the recently deployed first detection unit of the ORCA detector offshore the coast of Toulon, France. 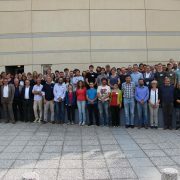 Colleagues of the IceCube Collaboration and from the GVD Lake Baikal Collaboration will join during the weekend for the yearly MANTS meeting of the GNN Global Neutrino Network. 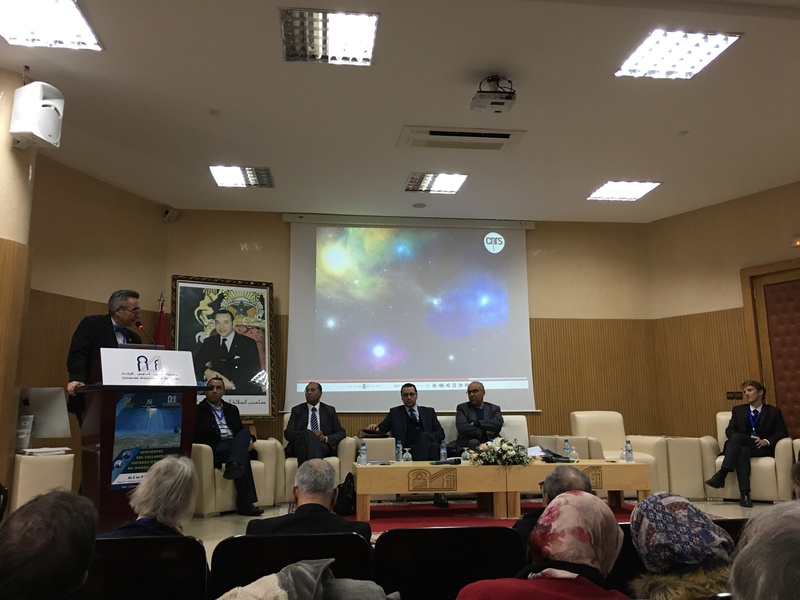 Congratulations to Rainer Weiss, Bary Barrish, Kip Thorne and the LIGO-Virgo Collaboration! The KM3NeT Collaboration congratulates their pioneering work and the LIGO-Virgo Collaboration for this award. From a brilliant idea to an impressively sensitive instrument detecting the most violent events in the Universe!